We’d love your help. 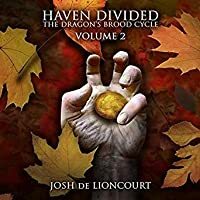 Let us know what’s wrong with this preview of Haven Divided by Josh de Lioncourt. Time does not stand still, however, and the dark legends are true. They deal in blue fire; they deal in death; and they travel through the long nights on autumn winds. To ask other readers questions about Haven Divided, please sign up. Even better than its predecessor... And that's saying something! I find this book challenging to review on its own merit, because my design, it doesn't stand on its own. It is called Volume Two for a good reason, picking up pretty much where the first volume, Haven Lost, left off. I very much enjoyed the first volume. I enjoyed this second volume even more. The author has a gift for putting the reader right into the middle of any environment, using vivid description which stimulates each of the Even better than its predecessor... And that's saying something!